Laser therapy is a great, new treatment option for people suffering from foot and ankle pain. People suffering from heel pain, tendonitis, neuropathy and more are treated safely and effectively with our MLS laser. The laser is a great alternative to needles and medications. It is safe, effective and doesn't have any side effects. 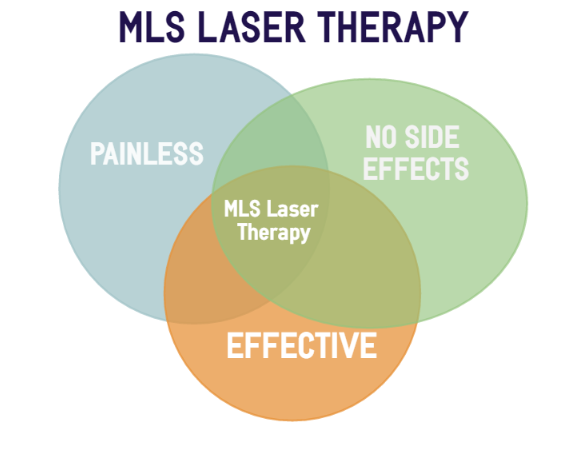 The MLS laser acts as a jump start for the body to begin healing itself. It draws oxygen and blood to an injured or painful area which is necessary for healing. It will reduce inflammation and pain naturally without the risks associated with surgery and strong pain medications. It is a holistic approach to ending your pain and getting your life. Our patients are loving the use and effects of the MLS laser. It is safe, painless and convenient. If you are dealing with pain in your foot or ankle, and are looking for a safe treatment, you should discuss the laser with your doctor. It is time to begin your treatment without the worry of risks. Call our office today!